IPPE’s 5th International Conference in Political Economy that took place 16-18 September 2014 at was a great success. 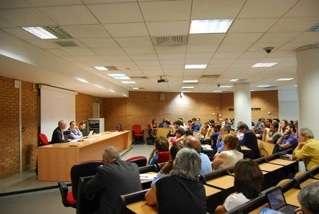 The University of Naples L’Orientale hosted some 260 participants from 38 different countries and 5 continents. A diverse range of papers were presented in 71 Panels that ran across the 3 days of the conference. Each day of the conference concluded with a plenary session pertaining to the nature and prospects of the crisis and the possibilities of alternatives. The plenary speakers included prominent academics and activists Anastasia Nesvetailova, Anwar Shaikh, Trevor Evans, Francisco Louça, Hilary Wainwright, Euclid Tsakalotos, Emiliano Brancaccio and Mario Pianta. In addition to high level academic contributions, the conference attracted many activists indicating a clear interest in building a more stable and constructive interaction between academia and activism within IIPPE. As with the 4th annual conference, this year’s event was preceded by a one day training workshop delivered by Simon Mohun and Marco Veronese Passarella with 40 or so in attendance. On top of the usual conference activities the local conference organisers arranged a host of cultural events on the days either side of the formal meetings. Conference participants were welcomed to Naples on the evening of the 15th, with an outdoor concert of Neapolitan music staged on a public square of the old city, surrounded by the historical buildings of The University of Naples. The music to which we were treated told stories of workers’ struggles and narratives drawn from the social fabric of everyday working class Neapolitan life. On the days that followed the conference, participants had the chance to take part in a social programme that included trips: to the unique archaeological site of Pompeii; toProcida, one of the Islands of the Gulf surrounding Naples; and to the crater of Vesuvius. IIPPE would like to thank all those involved in the organisation of the conference. In particular we are grateful to the local organisation team that included Michela Cerimele, Pietro Masina, Lorenza Monaco and Francesco Pontarelli, together with their brigade of enthusiastic volunteers. The 6th annual conference will be held at the University of Leeds, 9-11 September 2015. A preliminary call for papers can be found on the back page of this newsletter. No Replies to "Another Successful Annual Conference"